Brilliantly curated content, Volume 23 of THE ADDRESS Magazine is a 560-page celebration of stunning homes and an elegant lifestyle. As one of the leaders in style and luxury, this premium “coffee table” magazine showcases an edited selection of the finest luxury homes, luxury properties and estates for sale around the world, stretching across the globe from tropical islands to picturesque pastoral landscape, from exciting cities to impressive weekend getaways. As an international lifestyle magazine, THE ADDRESS brings the best of global property and lifestyle. The appeal of an extraordinary home is its distinctive character, and THE ADDRESS Magazine showcases homes that embody the fine tapestry of unique settings and diverse styles. Beautiful destinations and great food all come together in the regular Food & Travel section. Moreover, the stylish magazine brings its top picks when it comes to fine living and well-being; both new finds and old favourites. Dreaming of owning a large, spectacular and historic building, THE ADDRESS Magazine offers the chance to acquire a prestigious French chateau for sale in Normandy. Here one can experience luxurious splendour, history, magnificence and exclusivity. Reflecting the taste of French finery of centuries past, this beautifully luxurious chateau in Normandy is in a league of its own, having the cachet of a regal lifestyle. As one of France’s most beautiful regions, Languedoc-Roussillon is blessed with glorious year-round sunshine and is a perfect destination for a holiday home in Southern France. Vineyards stretching as far as the eye can see, medieval castles and ruins atop craggy hills, fragrant olive groves, long, wide sandy beaches, pretty seaside villages, elegant cities and atmospheric historic villages make up the landscape of this hidden gem. Thanks to the region’s outstanding natural beauty and cultural heritage, Languedoc property attracts a constant flow of international retirees, professionals and property investors. The highlight of Languedoc real estate in this issue is a vineyard estate on the waterfront, that offers a fine limited edition collection of new luxury vineyard properties for sale. An architectural triumph of contemporary design, readers will find a stunning family home in Koh Samui that is crafted with a strikingly modern architectural style – clean lines, an ultra-stylish vibe, dramatic living areas and expanses of glass. Designed with the indoor and outdoor space flowing together seamlessly, this is prime Koh Samui real estate at its best. If natural splendour and barefoot luxury is your idea of the perfect getaway, head to the Con Dao islands. Resting in the quiet waters of the South China Sea off the coast of Vietnam, Con Dao archipelago is a private and secluded retreat offering most stunning beaches and natural setting in Vietnam. Blessed with a sense of escapism, beauty, peace and tranquillity, the private residential villas for sale at Six Senses Con Dao showcases contemporary stylish décor and effortless luxury. Known for its exceptional quality of life, Algarve is an amazing place to retire, relocate, or purchase a second home or vacation home. With some of Europe’s most beautiful beaches, some of the continent’s top golf courses, magnificent cliff scenery, clear waters, charming villages and warm year-round climate, it is no surprise that Algarve real estate is in high demand. 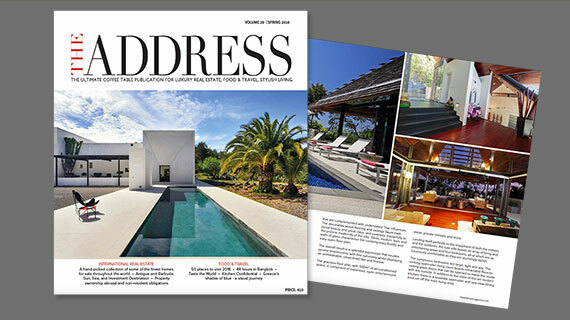 This issue of THE ADDRESS Magazine features an impressive selection of luxury Algarve homes for sale including luxury Monte Rei frontline golf villas for sale, a luxurious villa at Quinta do Lago for sale, a cutting-edge modern villa for sale in Lagos, a striking country residence in Vale Telheiro for sale, and an oceanfront villa in Ferragudo for sale. As one of the most diverse and captivating regions of Spain, the market for unique and luxury properties in Andalusia is characterised by robust demand for large but tightly held prime real estate. Looking for that perfect primary residence or a holiday home, do not miss this issue’s carefully selected luxury country properties in Andalusia for sale, including an elegant and historical hacienda, a grandiose villa just outside Jerez de la Frontera, one of the finest haciendas for sale in Andalusia, a phenomenal ultra-modern equestrian property for sale near Seville, and an exceptional mansion house for sale in Córdoba. Set against the dramatic backdrop of shimmering waters and snow-capped peaks, Italy’s famed lakes region – Garda, Maggiore and Como- is the quintessential vacation home destination. In this issue, readers will find an exclusive home for sale in Stresa, a historic palace property for sale near Varese, a prestigious property for sale in Luino, and a splendid period villa apartment for sale on Lake Como – all offering that quintessential lake lifestyle. Over the years South of France has remained one of the most desirable regions in France with Provence real estate continuing to attract international buyers. Given its ideal location, its rich history, and stunning landscape, the Provence region is one of the most in-demand areas of France by both locals and foreign property investors alike as a holiday home destination. In this issue of THE ADDRESS Magazine, we have selected three luxury properties for sale where the Provencal lifestyle is perfected to its fullest. The Private Residences at Six Senses Freedom Bay St. Lucia are setting a new standard for luxurious Caribbean living in an iconic setting. St Lucia is the probably the ultimate island paradise with its towering volcanic peaks, tropical rainforest and white sandy beaches bordering crystal clear waters. No wonder then that it is becoming the darling of the rich and famous, attracted by the stunning scenery, its luxury hotels and prime real estate. THE ADDRESS Magazine offers a unique opportunity to invest in ultra premium branded Private Residences Freedom Bay St. Lucia. Also, in this issue of THE ADDRESS Magazine readers will find luxury properties for sale in Bahamas; property investment opportunities on a private island in South-East Asia at Alila Villas Koh Russey in Cambodia; luxury country house for sale in Castile-La Mancha; modern architecture houses for sale in Madrid, modern villas sales at Anahita Mauritius, a sumptuous apartment for sale in Paris Trocadéro, a prestigious Florentine property in Tuscany, and a fine Venice property for sale in the Veneto region. The market insight features in this issue include “The Rise of the Global Citizen” and 17 Property Market Insight articles. THE ADDRESS Food & Travel section is the ticket to some of the world’s most fascinating destinations. Discover the majestic island of Taiwan from the bustling Taipei city to the tranquil Sun Moon Lake in this outstanding travel piece. The Republic of Palau is scenically magical. It is impossible not to be in awe of its extraordinary array of natural wonders: this is an archipelago of about 200 largely pristine limestone and volcanic islands, blanketed in emerald forest, that seems to float with a supreme majesty in a turquoise lagoon surrounded by stunning coral reef. For tasteful travellers in search of stylish secrets. Specialising in unique vacation homes, Select Retreats International handpicks vacation rentals and small hotels that are truly original and special. You can find a preview in THE ADDRESS Magazine of three Provence vacation rentals, which are the perfect place to call home for a week’s escape in the South of France. The foodie inspired luxury lifestyle publication features in each issue profiles and interviews with a leading chef, plus two signature recipes. In this issue we talk with Diego Cardoso, executive chef at Percy & Founders and The Lighterman, London, UK. Finally, explore our photo essay “Mallorca’s timeless beauty”, a celebration of the dramatic, idyllic and picturesque beauty of this magical island.